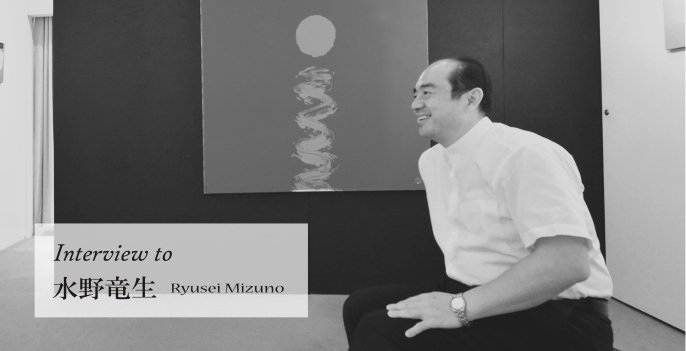 Ryusei Mizuno learned Japanese painting at Tokyo University of the Arts, oil painting in Paris, and suiboku (ink) painting in Shanghai, and currently, is an exceptional free-style painter; his vibrant brush strokes and brilliant color sense have won him a following both inside and outside Japan. Following in the footsteps of Kai Higashiyama and Matazo Kayama, he was invited to hold a solo exhibition at the national Shanghai Art Museum, and at the National Art Museum of China in Beijing he held a joint exhibition with a Chinese artist. To date his activities have attracted much attention in Asia, and lately France, the US West Coast, and Australia have been picking up on his work. It is clear the appeal of his art is not limited to his home shores, and that his paintings bring joy to people of many places and cultures. Currently, Gallery Sakuranoki Ginza is holding its 8th solo exhibition for the artist, entitled “Beautiful Sunrises.” Like the Impressionist painters, Mizuno paints his landscapes outside under the sky. His theme for 2012 is “Beautiful.” He told us his first self-imposed challenge was to encapsulate into a painting the experience of being rooted to the spot and struck speechless by the overwhelming “beauty” of nature. He then decided to paint the iconic moment of sunrise, and over about 5 months from the end of February 2012 through to July, he arose before dawn at 3:30 on more than 90 mornings, but despite arriving early enough, the weather was often against him and the rising sun was hidden from view. Now, in our gallery, over 40 of his works capturing the early morning sun and sky are on display. We interviewed the artist in the gallery surrounded by his works and asked him to tell us the secret of his art. Q. Where does your color palette come from? A. If I was influenced by anything, I think in large part it is probably ballet costumes. From earliest childhood, the world of ballet was always close to me, and I really enjoyed seeing such a wonderful spectacle, and when I was immersed in such beauty, those colors filled me up. In daily life, the vibrant colors found in temples also live inside me. The muted colors of the earthen walls, or the brighter colors used in their majestic structures; these colors are typical of Japanese style. As for the rest, when I look intently at the color combinations in the military designs used in radio-controlled airplanes or the like, the inspiration for the colors just arises. Q. You are a pleinairist, an artist who paints outdoors, and you paint on the spot. First of all, when you pick out the first color, how do you start the process of painting? A. Yes, I will explain the steps I go through. Firstly, the night before in my mind I completely compile the possible combinations of the colors that I will use. Then after waking, I travel to the location, where on my palette, I arrange some paints as my starting lineup, choosing from the combinations that I saw in my mind before sleeping. This is the start. Then in front of the scene, I completely empty my mind until I assimilate it all. There are two factors which are essential; I need a pleasant location and I must become one with the scene. It’s also important for me to doze off or play the ukulele to relax. Next I wait for the sunrise, just waiting for the moment to paint to come. Once I start painting, I work without stopping. The picture rapidly comes together and is suddenly finished. Q. That’s true. When on the spot, you cannot try one way and then another…You cannot waver, can you?